Visual, 22.5” x 22.5” approx. Description: Another Rendition of a Carol Tate Original Hand Stencil Printed Design Influenced by Damask Floral Surface Design of Europe. Prior to Hand Printing the Fabric for These Decorative Pillows, Horizontal Lines of Liquid Resist were Drawn Across the Fabric. These Lines Would Act to Repel the Yellow Pigment Later Stamped Through the Cut Stencil. The Resist was Later Removed, Exposing the Elements Interrupted by Subtle Lines. This is a Very Involved Process, Akin to Wax Resist Batik. 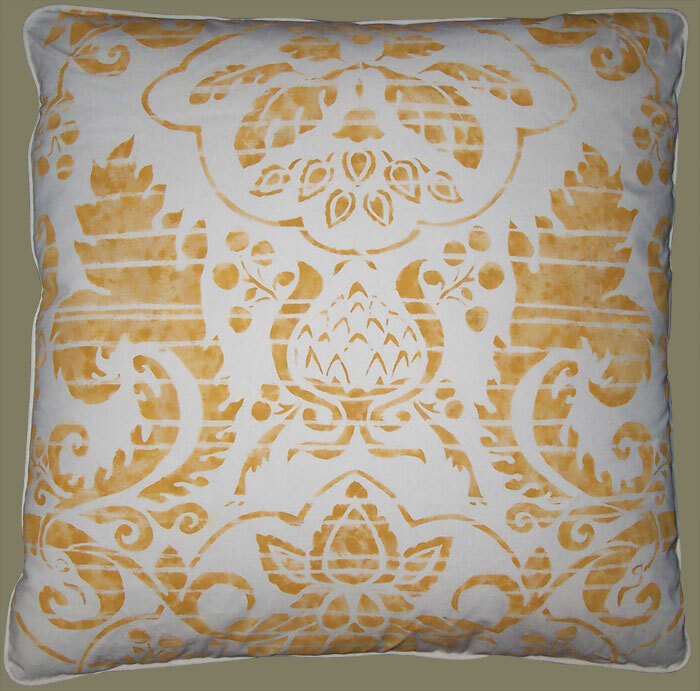 The Yellow and Off White Produces a Very Cheerful, Sunny Pair of Large Accent Pillows. Each Linen Blend Pillow is Loosely Filled with 90/10 Feather Down Pillow Inserts, Self Welted, and Have High End Hand Stitched Closures. This One of a Kind Pair of Decorative Artisanaware Pillows Would be Perfect for an Enclosed Sun Room or Porch, Propped Up on a Bed Draped in Old Linens, or Atop a Muslin Slip Covered Sofa. Pillows Designed, Hand Printed, and Fabricated in the Artisanaworks Workroom Studio, USA. Experiment with Print and Pattern Mixing by Combining Companion Yellow and White Pillows: Border Hand Print, Woven Stripe, Window Pane Check, and Diagonal Check.